Singer, musician and producer Freddie McGregor was born on 27 June 1956 in Clarendon, Jamaica . 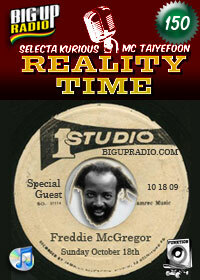 Freddie McGregor's career began at the age of 7. In 1963 he joined with Ernest Wilson & Peter Austin to form The Clarendonians , and began to record for the legendary Studio One label. Freddie worked with producer Niney The Observer during the late 1970s & early 1980s. His popularity soared in the early 1980s with the release of Bobby Babylon. He has also worked with producers Junjo Lawes , Linval Thompson & Gussie Clark . Freddie has toured extensively and continuously. He established the Big Ship Recording Studio , and has produced many artists including Luciano & Mikey Spice . He is a member of the Twelve Tribes organization.